That’s probably the only time I have ever agreed with Glenn Beck. There’s a first time for everything, so they say. It’s December the 26th. If you’ve yet been able to move yourself from your favourite chair you may have made your way over to the chocolates that were given to you as a gift. But – horror of horrors – what if you didn’t get any? Although hard to believe, I do have the answer for you in case you’re in that predicament. 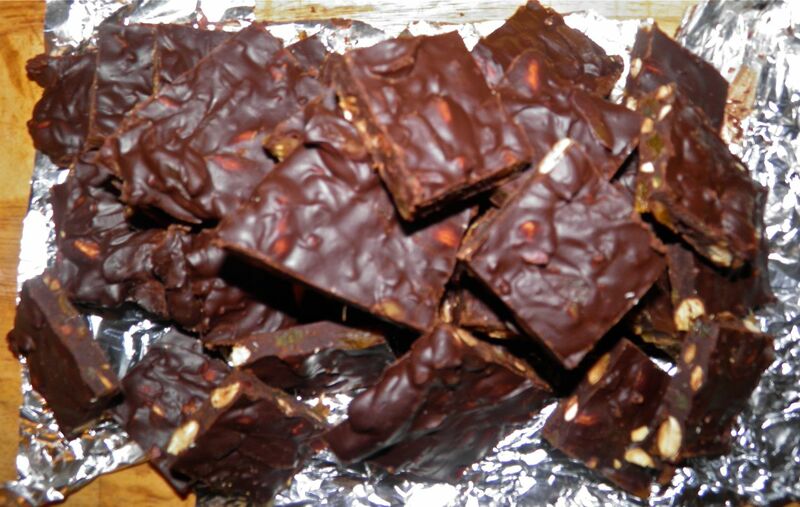 Homemade almond bark. This is the first time I’ve made a bark. There’s all kinds of recipes out there. Some take almonds or any other nut. Some have no nuts at all, like candy cane bark. Some combine white and dark chocolate in a decorative swirl. Since it seems to be open season on what goes into bark, I decided to put my own particular twist in mine, as you would expect. This all started because I found myself in possession of a cup of candied ginger. It was a by-product of making ginger syrup. I couldn’t just let it go to waste. If you don’t have any candied ginger just hanging around other candied peels can be substituted. I believe you can purchase them pre-candied at the grocery – possibly ginger as well. I saw a recipe that contained apricots and almonds and I though a great accompaniment would be my ginger. 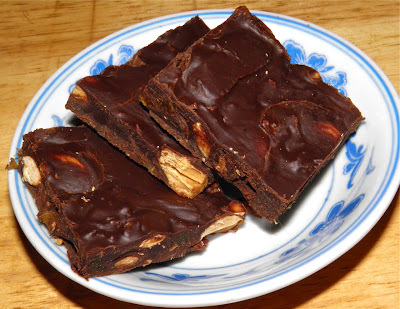 Almond bark is unbelievably easy to make. 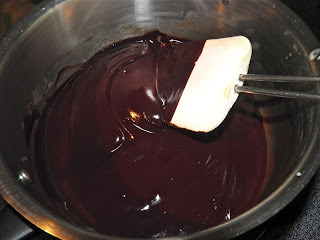 Some recipes call for melting the chocolate over a double boiler and other complicated procedures. I did a work around by adding cream (just a little) to my chocolate. No need for a double boiler and the end result is a bark that is a little softer than the just chocolate variety that shatters when you bite it. This isn’t an instant gratification type of recipe. You have to wait for the chocolate to re-harden. But it’s worth it. Just in case you don’t have enough cookies and candies hanging around, give this a try. The bits of hot sweet ginger are an unexpected pleasant surprise. If using non-roasted almonds, toast them slightly in the oven until the skins begin to brown slightly, about 5-6 minutes. Crush slightly. 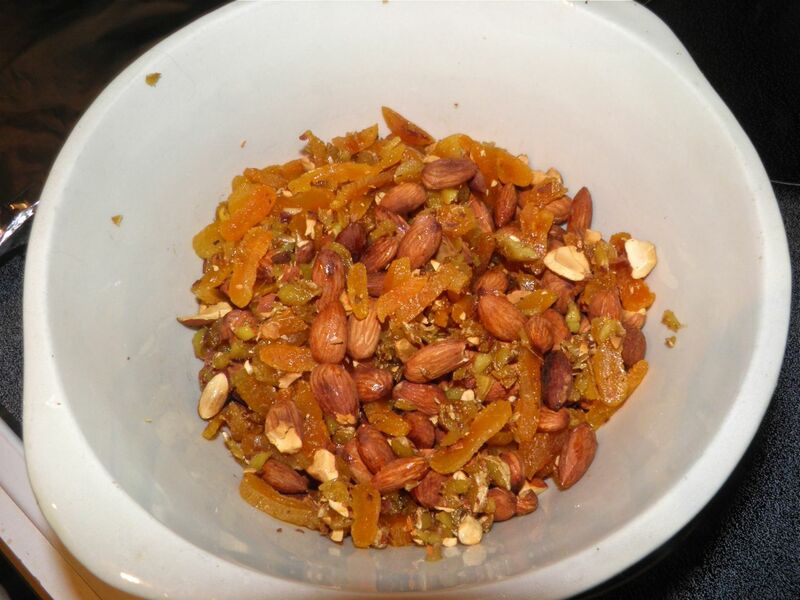 Chop the apricots into thin slivers. Chop the candied ginger into fine pieces. Melt the chocolate by placing the cream in a saucepan over medium low heat. Add the chocolate and stir constantly until completely smooth. Do this slowly. the mixture will just barely be steaming. Remove from the heat and stir in the vanilla. Then add the almond, apricot and ginger. 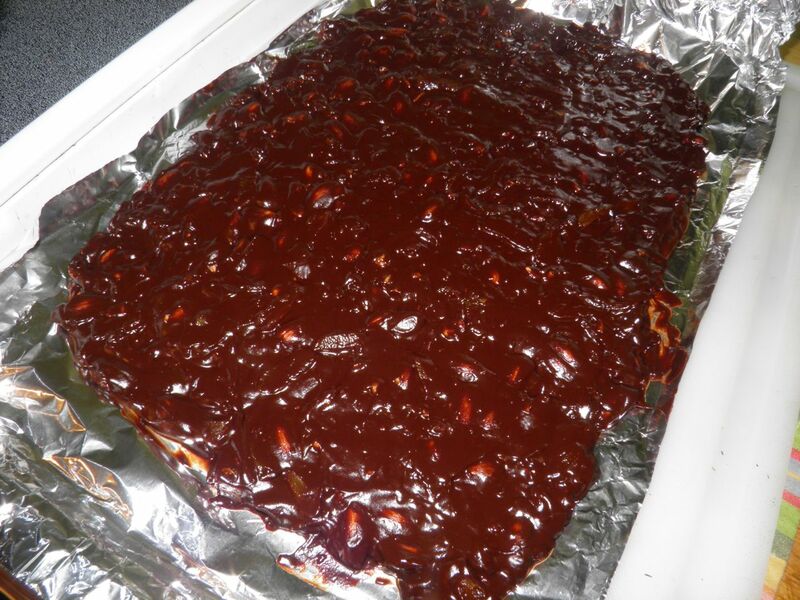 Mix well and spread out to about 1/4” thickness on a foil lined baking sheet. Let cool on the counter until set. Then cut into approximately 1-1/2” squares. If you wish, hurry the process along by refrigerating the bark. Make sure you gut it before it's too cold!